Introduction: Perfusion - what is that? ..and what is a perfusionist? A perfusionist is a professional health worker and a part of a surgical team during open heart surgery. 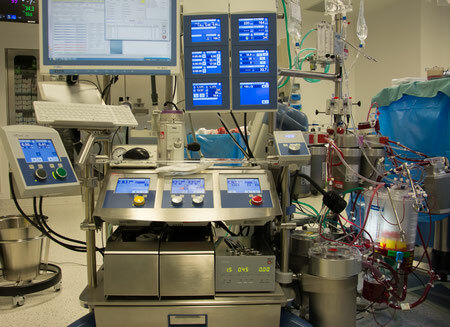 The perfusionist is specifically responsible for the selection, setup and operation of a heart-lung machine (picture). On several types of heart surgery the patient's heart and lungs are being stopped so that the surgeon can get optimal working conditions. The heart-lung machine takes over the function of both heart and lungs during heart surgery. During such operations the perfusionist is responsible for this machine and will also be able to cope with any complications and take appropriate action in relation to the patient's circulation. Besides operating a heart-lung machine during surgery the perfusionist has numerous other functions. This may be operating equipment which is used in circumstances where the patient is in need of prolonged assistance of circulation, eg. heart and lung failure. The activities and responsibilities of the perfusionist may vary based on individual working environment. CPB - What is cardiopulmonary bypass?